Please call the Morton Cemetery Association at 281-239-3648 to make arrangements for burials. If you are working with a funeral home, please have them contact our office to make the arrangements for you. We require the lot owner or next of kin to complete and sign the Burial Information form. We also require a copy of the Report of Death and a marking fee. Even though Morton Cemetery is a historic cemetery that began in 1825, it continues to grow and offer the families of the Fort Bend County area a peaceful place to inter their loved ones. We have many requests for spaces in the older, original sections of the cemetery but unfortunately there are none available. However, we still have spaces available in Section 3 and AEM. These new sections are located near the open-air chapel and newly planted live oak trees and contain approximately 1100 available spaces. If you are interested in purchasing spaces in Morton Cemetery, please contact our office to schedule an appointment. 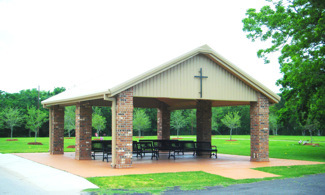 In 2008 an open-air chapel was constructed in Morton Cemetery. This chapel is available for burial services or group gatherings. Please contact our office to make arrangements. If you have any records of deeds, photographs, obituaries or general information about the cemetery or those interred in the cemetery, please share them with us. Per the Morton Cemetery Associations Rules & Regulations, prior to placing a marker, curbing or monument, permission must be obtained from the Association. 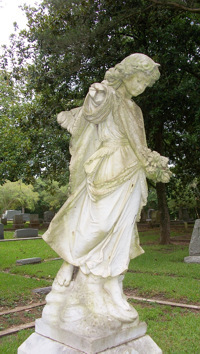 Any person or business planning to do work of any nature within the cemetery grounds or upon any lots and graves shall be required to give two business days written notice to the Association and shall agree to abide by the Rules and Regulations as well as any directions from the Manager/Superintendent or other Executive Officer of the Association. Please refer to the Rules & Regulations for the complete requirements. Please use the Work Approval Form to submit your work requests.